Red Deer Advocate, December 24th, 2011. Gay activists cry intolerance, gay bashing, or, as in this instance, ‘abuse,’ at every opportunity, even when no violence is done to them, even when nothing is done against them but verbal opposition to their ways and views. They will not be content until they force the institutions they hate to celebrate what those institutions, by nature, are ordained to be against: sin. 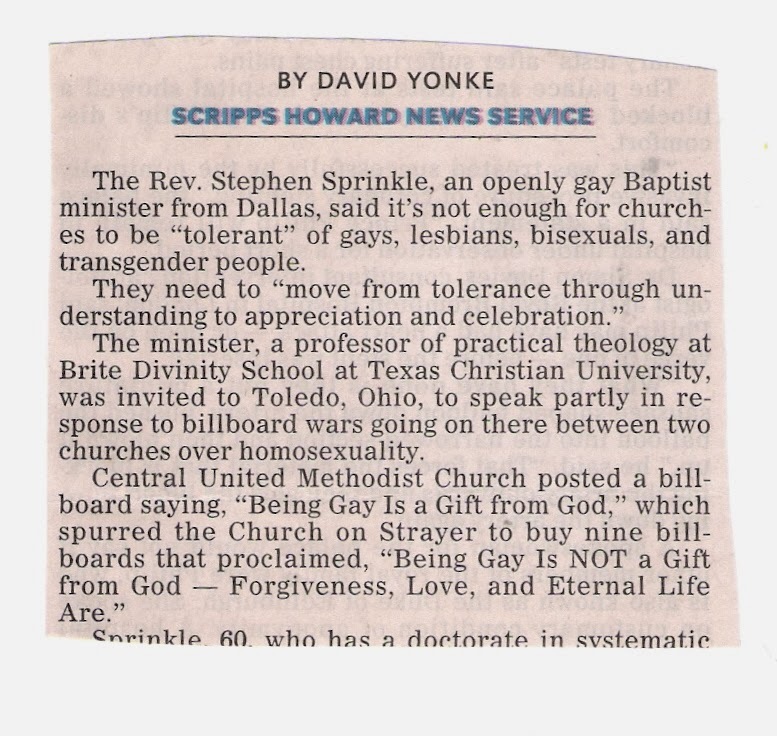 Imagine a real minister of God’s word crying to have his office and sermon accepted in a gay bathhouse. There would be no tolerance of that! 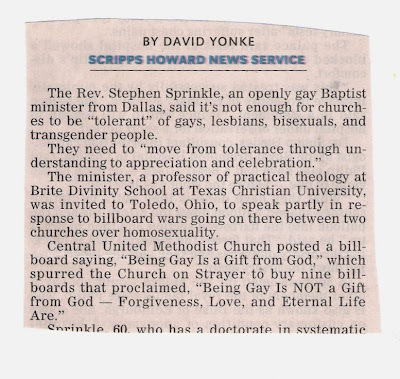 Yet churches are expected to accept gays into church, to allow them offices there, and to listen to their perverted versions of peace, love, and truth! Double standards are alive as ever in societies that have condemned male chauvinism in favor of what is politically correct! Now if New Testament rules dictate that fornication be not tolerated in the churches of God, it is logical to assume that fornication of the least natural sort be not tolerated for sure, which may be inferred from the anti-homosexual passage in Romans 1. The illegitimate minister will grasp at anything to have his lifestyle tolerated and celebrated by those who are commanded to condemn it. That homosexuality is not mentioned in the Ten Commandments is no proof that churches ought to accept it. That the lifestyle is condemned by the apostle Paul is proof enough that churches ought never to condone it in their midst. “God gave them [LGBTQ] up to vile affections” (Romans 1.26.) Are we to believe that what God gave up as vile the churches are to accept? This verse, even partially quoted, is proof that gays and their sinful associates are not to be tolerated, understood, appreciated, or celebrated by Christians of God’s holy Church. This is not to say that repenting gays be not accepted. That is a different matter. Evangelical repentance by a gay person implies a turning from the gay lifestyle and from sin in general and a turning toward what the Bible teaches, which includes the rejection of gay persons who are not repenting. Gay persons who come repenting should be accepted. Whatever else the Church on Strayer stands for, its billboard message is a good saying. The more churches and Christians speak out against what they are being forced to revel in, the more they are being true disciples who imitate the apostle Paul and the Scriptures at large, and the less ground will be gained by the corrupters of good morals: the increasingly militant, strange, and bizarre LGBTQ crowd.